When Skye Paine first told me that he was thinking of starting a podcast focused on vintage Star Wars collectibles, my response was something like, "Who wants to listen to people talk about toys? Listeners won't even be able to see the items you're talking about. What's next, a phone-in petting zoo?" Fortunately, that didn't deter Skye from moving forward with his plans, and six years later the 'Chive Cast (or whatever we're calling it now) is still going strong. I think it's fair to say that it stands as one of the best things we've featured on the Star Wars Collectors Archive. Skye and Steve have had quite an impact: Multiple vintage-focused podcasts have followed the trail they blazed, each with its own unique style and take on collecting. To my mind, that's a tribute to the 'Chive Cast, as well as to the ingenuity and vigor of the vintage collecting community. You may be a bunch of nerdlingers, but at least you're an industrious bunch of nerdlingers. In all seriousness, we're living through an era rich in hobby discussion, forums, and platforms. So I was glad to see that Ross Barr contributed this piece on the world of vintage podcasting. It serves as a primer for those who have yet to sample this growing area of the hobby. By the way, don't let Ross fool you into thinking he's a "Joe Schmo." Every time I look at Facebook, there he is staring back at me, often bare chested. At first I thought he was the result of some kind of glitch or malware. I slapped my computer, repeatedly pressed control-alt-delete, even called my internet company to inform them of my suspicion that North Korea had hacked into my computer and replaced all the cat videos with photos of some naked guy. Didn't work: Ross was still there. Then I realized that Ross is simply the hardest working man in the social media arena -- a guy whose energy is nearly equal to the unsightliness of his dishabille. So while we're busy appreciating podcasts, let's take some time to appreciate Ross for all the effort he puts into promoting the hobby. Clothed or otherwise. As vintage Star Wars collectors, we fortunately benefit from lots of pretty, pretty pictures of collectibles in various online forums, collecting groups, and websites. A collector doesn't have to look too long before he or she finds a wealth of information about our hobby online, along with some great images that are pleasing to the eyeballs. An important but perhaps unfairly overlooked aspect of the hobby, however, is the great work being done by several vintage collectors in creating podcasts covering numerous angles related to vintage collecting. Why should our eyes have all the fun and our ears not have any? Full disclosure: I have been an active listener to certain vintage-related podcasts for only about the last year or so. But it appears that podcasting has recently become the en vogue medium for expression, the way that blogging was a few years ago. As such, you may ask, "Well, Ross, aren't you reviewing podcasts on a blog right now? If you want to be fashionable, shouldn't you be podcasting about podcasts instead?" I'm old school, I guess; just be happy this isn't a newspaper article that I'm presenting to you on an overhead projector. In all seriousness, I get great pleasure from seeing on iTunes that one of the podcasts to which I subscribe has released a new episode. I gobble them up, listening to them during my work commute, at the gym (yes, I work out...you couldn't tell? ), and whenever I want to escape something my wife is trying to tell me about. In fact, being relatively new to podcasting, I have spent much of the last year going back and listening to most of the archived episodes of the four podcasts I discuss in this piece. It has been a blast hearing how the hobby and collecting perspectives have changed over the past several years. If you haven't already, I wholeheartedly recommend that you do something similar – you can tell a lot about today’s environment by listening to how folks viewed yesterday’s. 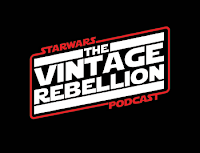 The purpose of this blog entry is to review four podcasts I highly recommend to anyone who wants to treat their ears as well as their eyes when it comes vintage Star Wars collectible content. I present each of them in descending order from, in my own modest opinion, the most “vintagey” (spell check, anyone?) one to the one that has the highest concentration of modern collectibles and other content mixed in with the vintage discussion. The ‘Chive Cast is the official podcast of the Star Wars Collectors Archive, the self-proclaimed “audio magazine dedicated to the collecting of vintage Star Wars toys and memorabilia.” The ‘Chive Cast is hosted by Skye Paine and Stephen B. Danley, Chewbacca and B-Wing Pilot focus collectors, respectively. “Fratastic” Pete Fitzke and “Brisbane-Brisbane” also Mike Lonergan contribute market data to the podcast. The longest running vintage podcast in this review, the ‘Chive Cast debuted February 27, 2010, and is, as of this blog entry, on its 69th episode, with some bonus episodes sprinkled in. I recommend the ‘Chive Cast as, in my view, the most educational of the lot when it comes to the history of vintage Star Wars collectibles; the production process as related to the toys themselves; and numerous other aspects of vintage Star Wars collecting. The podcast has no shortage of creative “drops” (musical intros) that lead into their interesting recurring features. These features include, among others, "MarketWatch" (a review of recent sales), the “Nugget from the Archive” (an in-depth look at an item listed on the SWCA), “Vintage Vocab” (an explanation of hobby-specific words for newbies and old timers alike), and the “Unloved Item” (a look at oddball and overlooked items). I personally love the format of the show. At the end of the day, when it comes to education and pure vintage Star Wars collectible discussion, the ‘Chive Cast may be at the top of the class. Skye and Steve care a lot about the hobby, and have put in many, many hours over the past six years to deliver an incredibly solid product. Heck, they even had rock star and super collector Rick Springfield on the show one time. I am a huge fan of their show. 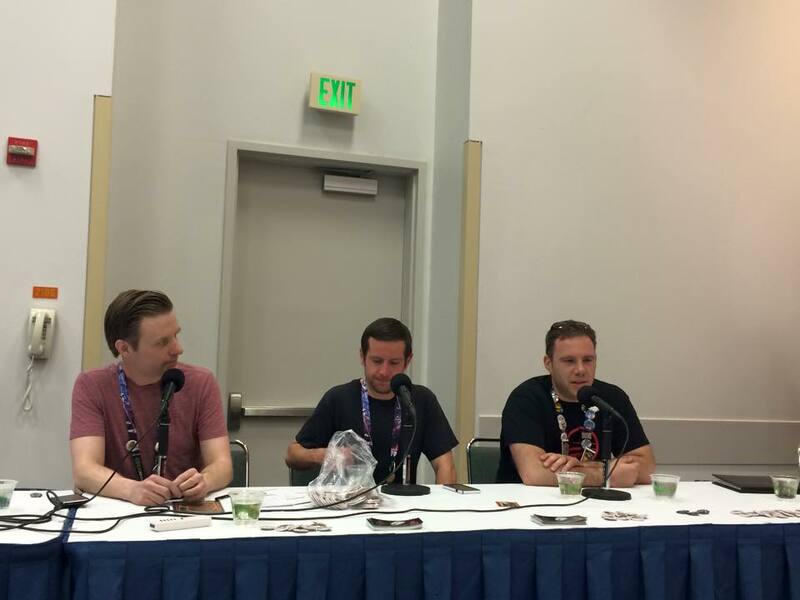 You can find the ‘Chive Cast here on the SWCA Blog at: http://blog.theswca.com/search/label/podcast, on Facebook: https://www.facebook.com/chivecast/ or on iTunes. Formerly known as the SWFUK Podcast, The Vintage Rebellion is “a Star Wars podcast focusing on vintage toy collecting by a group of fans.” The show is put on by five fantastic and fun-loving guys out of the UK – Stuart Skinner, Grant Criddle, Richard Hutchinson, Peter Davis, and Jez Allinson, who are Greedo, TIE Fighter Pilot, R5-D4, Slave Leia and pregnant Padme (I’m not making this up), and Luke X-Wing Pilot collectors, respectively. The second youngest of the podcasts discussed here, The Vintage Rebellion debuted on June 8, 2014, and, as of this date, has produced 21 episodes. The Vintage Rebellion does a spectacular job of making their podcast personal to the hosts while capturing all that is going on in the various communities that exist in our hobby. 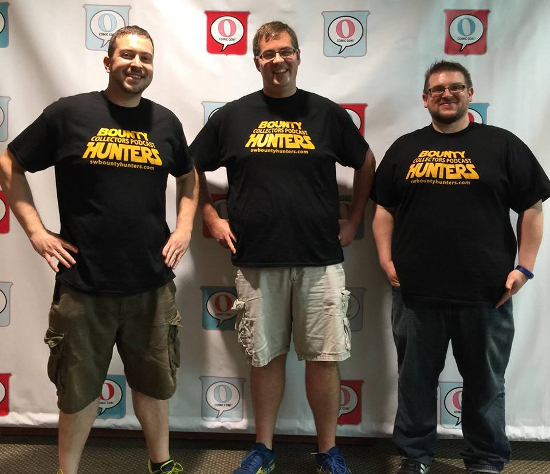 The format of the show is similar to that of the the ‘Chive Cast, as each show has various features, including a discussion of each host’s recent acquisitions, a “forum roundup” of the goings-on in several online forums and Facebook groups, “rapid fire” questions posed to those among the group, and interviews of interesting and diverse guests. 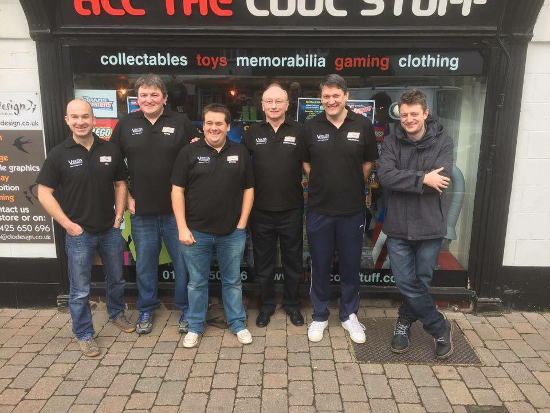 Even though the hosts of the show will probably tell you that they got their start in the hobby on, or, at the very least, currently spend most of their time on Star Wars Forum UK, they have all have a presence in the wider community, and they present a fair and balanced look at what is going on in the hobby from the perspective of many, many different types of collectors. I love the various Star Wars-related songs they play on the show, although the theatrical skits they put on are, frankly, painful at times. They typically play trivia games among the hosts, which, although a bit fanboy-esque, certainly present some difficult and interesting aspects of the films. Their podcasts tend to run long – the longest to date being five hours and four minutes, with most averaging around four hours – but, hey, didn’t a wise man once say that you can never have too much of a good thing? Overall the guys have great chemistry, and you can tell they are all good friends. After listening to a few of their shows, you will wish you were good friends with them too. Having been on the show a few times, I can say they treat their guests with respect and handle their topics with diligence. Their contributions to the hobby shouldn’t be overlooked, so check them out. You can find the lads at https://www.facebook.com/The-Vintage-Rebellion-497429320411772, http://swtvrpodcast.podbean.com, or on iTunes. Galaxy of Toys Podcast is “a discussion about Star Wars toys vintage to modern,” and is hosted by Jason Luttrull along with Tom Berges, Ryan Beise, Chris “Criz Bee” from JediBusiness.com, and Jake Stevens. They are, respectively, collectors of toothbrushes and Lobot, items from the late '70s and early '80s, pretty much everything related to action figures (Ryan “collects them all, from Bend ‘ems to the Black Series”), action figures with the occasional prop replica and life-size item mixed in, and vintage and modern 3 3/4" figures (Jake has “darn near completed collecting the 3700+ figures out there”). The second oldest of the podcasts discussed here, Galaxy of Toys debuted January 28, 2013, and, as of this date, has produced 53 episodes. Other than Tom Berges, whom I thoroughly enjoy, especially when his co-hosts make fun of him for being the “OT curmudgeon” (that is, a guy whose interests do not extend past vintage collectibles, and who playfully deflects questions about modern collecting), I don’t know the hosts of this show personally. But while listening to them you can really feel the passion these guys have for collecting all of the toys, whether vintage or modern, and they clearly know what they're talking about. I find this podcast especially fun, even if the subject matter doesn’t always line up with my interests, and I eagerly await each new episode. You can find Galaxy of Toys podcast at https://www.facebook.com/galaxyoftoys/, http://galaxyoftoys.podbean.com/, or on iTunes. The show focuses on vintage collectibles, modern collectibles, comics, and the movies themselves. 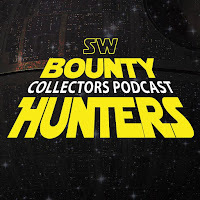 Unlike the ‘Chive Cast and Galaxy of Toys, which break out each show based on a particular segment of collectibles, Bounty Hunters, like The Vintage Rebellion, has a random theme for each show. The guys also organize each episode into various features, including the “Vintage Vault” (a discussion of a particular vintage collectible), “Modern Masterpieces” (a discussion of a particular modern collectible), the “Collector’s Cantina” (each month’s guest), and “Toshi Station Comics and Games” (a discussion of a particular comic or game). I know Bill reasonably well from interacting with him on the vintage Facebook groups (I don’t know the other two guys personally), and have witnessed firsthand his deep love of Star Wars. And that love, as well as the love of his fellow hosts, really shines through in their work. Serious vintage collectors are likely already familiar with most of the vintage information and discussion featured on the show, but the guys bring a really fun emphasis to everything they discuss, always approaching their subjects from the point of view of the die-hard fan. The guys have a great sense of humor and don’t take themselves too seriously, which is very refreshing. The show speaks to how most of us collect, which is something I really like about it. At its core, the hosts are really down to earth, and that helps them connect with their audience. I certainly recommend checking them out. 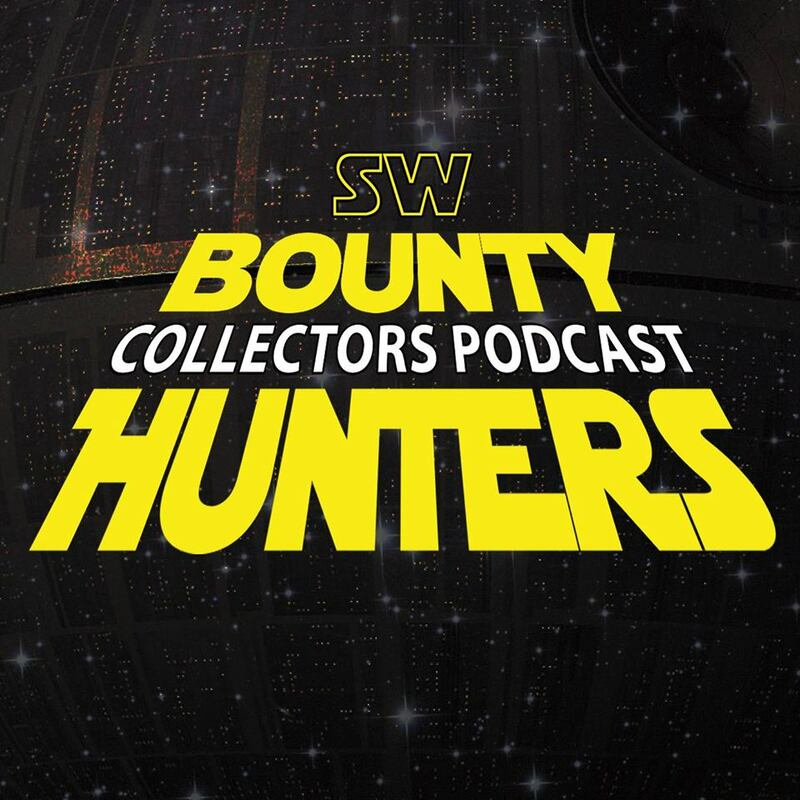 You can find SW Bounty Hunters Collectors Podcast at https://www.facebook.com/swbountyhunters/?fref=ts, http://swbountyhunters.libsyn.com/, or on iTunes. Superb write up here , as one my favourite bands , the Kinks sung once a many years ago ... "I'm a fully dedicated follower of SW vintage podcasts ...." I personally have listened to the vintage rebellion podcast for a year now and have regularly found my self going back to certain episodes to re educate my self or to find some little gem of Information on the vintage SW. Also I've filleted the Chive cast " which I find really good listen to and good to hear what our good friends in the good old USA are saying as regards all things vintage . But as for the other 2.... I've yet to listen to so after this fantastic write up I'll be sure to start Dow loading tonight ready for tomorrow's work day listening !